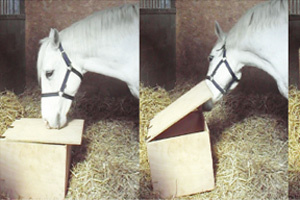 Example of behaviours in the chest test: Sniffing the lid; Lifting the lid; Opening the chest; and Eating food. Do horses expect humans to solve their problems? Researchers in France have tackled the question in a study of riding school horses. Dr Clémence Lesimple and her colleagues from the Laboratory of Animal and Human Behaviour at the University of Rennes 1 noted that domestic animals were highly capable of detecting human cues, while wild relatives tended to perform less well. They set out to explore the hypothesis that because domestic animals are so attentive and dependant on human actions for resources, it may result in a lowering of other cognitive skills, such as individual task-solving and a decline in self sufﬁciency. Their study, which measured the ability of French riding school horses to access a box known by the animals to contain food, supported the hypothesis. Their research revealed that the more interest the horses showed toward the human present, the less effective they were at the box-opening task. This was despite high motivation in the horses, expressed by investigative behaviors directed at the chest. “If human-directed attention reﬂects the development of particular skills in domestic animals, this is to our knowledge the ﬁrst study highlighting a link between human-directed behaviors and impaired individual solving-task skills (ability to solve a task by themselves) in horses,” they wrote. The researchers, whose findings have been published in the journal Frontiers in Pscyhology, performed the experiment between November 2009 and October 2010 on 46 horses distributed across ﬁve French riding schools. They used what they called the chest test, in which the horses were challenged to open a wooden chest in order to access food. To ensure the motivation of the horses, the test was performed in the hour preceding the usual meal time. The food placed in the chest was their usual food. The test comprised three three-minute trials. For the first, the horse was allowed to see the food. In the second it was allowed to smell the food in the chest, and in the third each horse was allowed to eat a mouthful. In all, the horses had a total of nine minutes to access the food. The time it took each animal was recorded. During this time, a raft of behaviours directed toward the box or the individual present in their stall were also recorded, including licking, sniffing, biting, and nibbling. They also recorded what the researchers called frustration/excitement behaviors: headshaking, quick vertical movement of the head, quick involuntary movement, pawing, snorting, whinnying and staring. Half of the horses succeeded in opening the chest within the three trials (23 of the 46 horses), and most of them showed some interest in the individual present, from mere gazes to exploration, such as snifﬁng and nibbling. “Interest in the experimenter was associated with failure to perform the task, as more than half of the horses that showed exploration behaviors toward the experimenter failed to open the chest, while only a third of those that did not failed,” the researchers said. “In fact, there was even a clear correlation between horses’ interest toward the experimenter and the time and number of trials required to open the chest. “Interestingly, this was not related to a lack of interest in the chest. “Indeed, horses that showed most interest in the experimenter were also those that showed most direct (but inappropriate) investigative behaviors toward the chest. Lesimple and her colleagues noted that the success of half the horses in completing the task was in accordance with some earlier ﬁndings in domestic horses in 1997 and 2011 research. “Both genetic and environmental factors (such as type of work) have been shown to inﬂuence performances in this task, which means that both the domestication process and experience may be involved in determining the success rate observed,” they said. Their own findings did not set out to determine which kind of experience could be involved. They concluded that domestication alone cannot fully explain the observed individual differences which may also reﬂect different levels of dependency on human actions. The full study can be read online in the Frontiers of Psychology. Correlation between the interest of the horse toward the experimenter and the time required to open the chest (Spearman correlation test,***p <0.001). Data are represented in number of behaviors and time(s) required to open the chest.